Hello dearies! Still enjoying summer? I know you are! 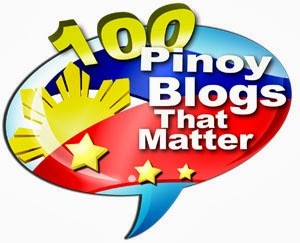 There are different activities that makes summer a well-loved season here in our country. A family vacation to one of the pristine beaches and resorts, a barkada outing and road trip to amusement parks, and joining summer activities like outdoor leagues and sports. This season is the season where we enjoy Mr. Sun the most, we don't care if we get a beautiful tan right? But with the activities I listed above, the more active we are, the more sweat we get especially that this insane heat makes us sweat more than the usual. 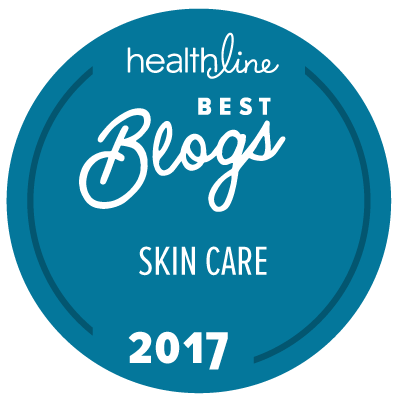 Even though we enjoy the weather, our skin is compromised and there are skin problems that we need to address. I sweat a lot during summer and excessive sweating makes my skin sensitive to bacteria build up. I get acne on my forehead that becomes reddish and painful if I don't address it immediately. I make sure that I'm armed with products that will prevent acne from popping out so when Safeguard sent me their latest facial wash, I said to myself that my normal beauty soap maybe not be enough to address summer acne as it does not provide long-lasting protection from germs. 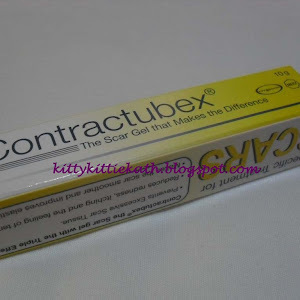 Scroll down to read more what I think of Safeguard Derma Sense for Acne-Prone Skin. 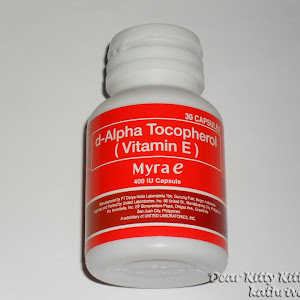 It is designed to address special skin needs, such as acne, which are manifestations of germ-related issues. It goes to the root of the problem by getting rid of the germs. Derma Sense comes in two variants for Acne-Prone Skin and for Sensitive Skin, and is available in cleanser, body wash and soap bar. 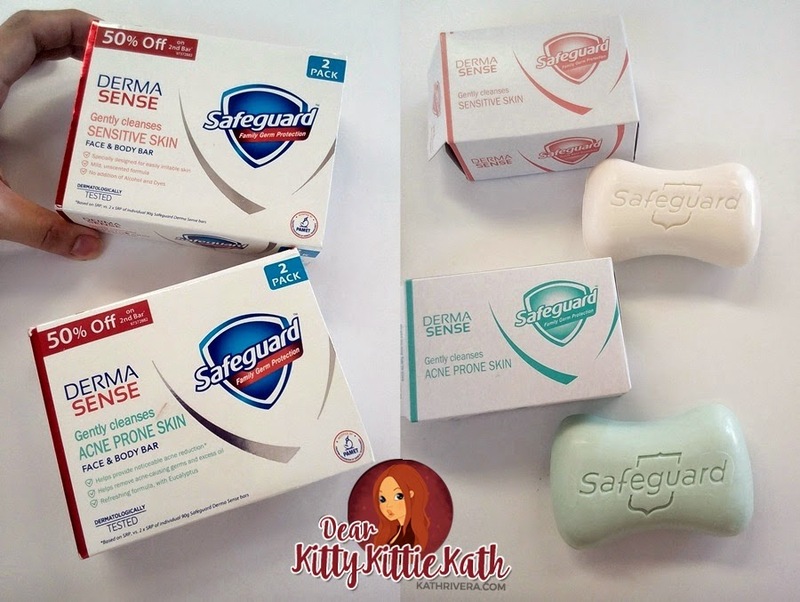 This product line from Safeguard is available in three types, the face and body bar, body wash, and facial cleanser. For those who are already used to using the body bar and have a tight budget, you can score this for a 50% off on the second bar. It's big savings because this soap can be used for face and body. If you're a body wash fanatic, they also have body washes for you! The sensitive and acne-prone body wash. The latter is great for those suffering from bacne. Remember that excessive sweating can attract bacteria so skin care product that protects you from germs is what you need. Finally for the face, the facial cleansers! These cleansers are the big hero this summer! As I've told you above, summer heat can cause excessive sweating and I'm in the group who sweat a lot even if I'm not that active at home. The sweat tends to run from my head down to my forehead and my face. 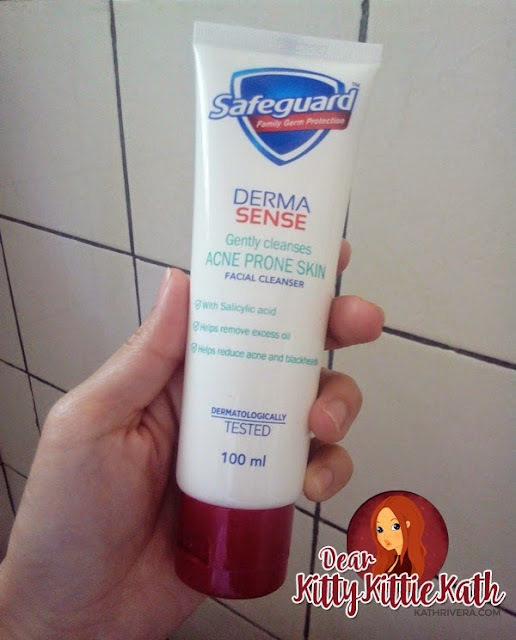 There are times that I'm prone to acne but with a good pimple/acne fighting product like Safeguard Derma Sense, the germs that will cause flare up in my skin will be prevented from forming. So when I received these facial cleansers from Safeguard, I was relieved because I believe Safeguard Derma Sense will save my skin from breakouts. Safeguard Derma Sense for Sensitive Skin is specifically designed for sensitive, easily irritable skin. It’s gentle on skin because of its mild, non-irritating formula, with no added alcohols or dyes. It’s dermatologically tested and maintains your skin’s natural defense layer. 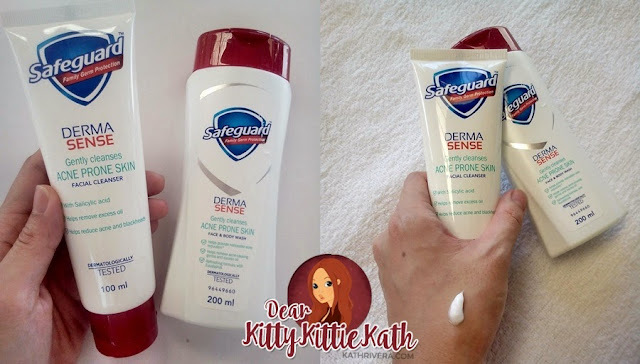 For this post, I'm going to share my initial thoughts on Safeguard Derma Sens for Acne Prone Skin Facial Cleanser. I occasionally suffer from breakouts, one before and after my period and another during summer because of sweat. apply on wet face in a mild and circular cleansing strokes. Rinse well. ingredients: Water, PPG-15 Stearyl Ether, Glycerin, Stearyl Alcohol, Cetyl Betaine, Salicylic Acid, Distearyldimonium Chloride, Sodium Lauryl Sulfate, Cetyl Alcohol, Steareth-21, Bhenyl Alcohol, PPG-30, Steareth-2, Fragrance, Niacinamide, Sodium Ascorbyl Phosphate, Disodium EDTA, Morus Alba Rooth Extract, Coix Lacryma-Jobi Ma-Yuen Seed Extract. It comes in a squeeze tube that dispenses the right amount of product. Can pass as odourless, so if you're like me who has sensitive nose, you will enjoy using this facial cleanser. The product's texture is thick so a little amount goes a long way. Using this product is a breeze, only mild circular strokes and you're done. My skin felt squeaky clean after using the product. I also felt my skin is soft and smooth to touch after use. The product is easily available. There's batch, manufacturing, and expiry date printed on the tube. Doesn't produce a good lather. This is only my initial review. 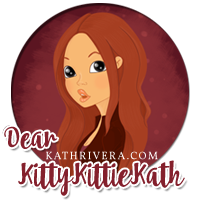 More thoughts about the product will be up on my next blog post. I'm so excited to share the results with you. 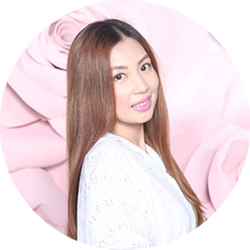 For the mean time, I'm inviting everyone to try Safeguard Derma Sense for clearer, beautiful skin so that they can confidently enjoy the summer season. Have you tried Safeguard Derma Sense yet? Share your experience below. I know you have great things to say about the product. Safeguard is a mainstay in our bath essentials and no doubt that this additional product from Safeguard is truly promising. nice product review! 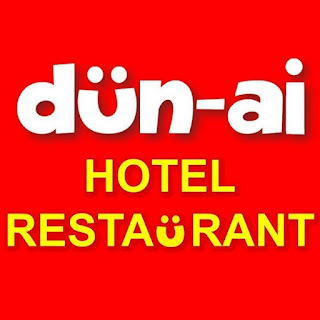 it has a good benifits that we can get.. Yes, because it is Safeguard! Thanks for the review sis. My son is using Safeguard Derma sense already and it is true that it fights pimples. Yay! Great job for Safeguard! Can I use the bar soap on my face instead of the facial cleanser? The bar soap is for face and body while the cleanser is for face only. Some prefer the facial cleanser for the face because of the texture, the lather, and moisturizing properties it has. But you can use the bar on your face if you like. No problem on that. Hi. On which part of the tube is the expiry date located? I saw some inscription on the uppermost part on the back, it says "B 260814-3" but I just purchased the product last week. It's at the back portion, bottom part to be exact. It's printed there in black ink. Yes, there's a black ink for the expiry date. Below the tube. Usually, B stands for the batch number. So this one is 15-May-2017. Expiry date of cleansers 2 years if unopened. 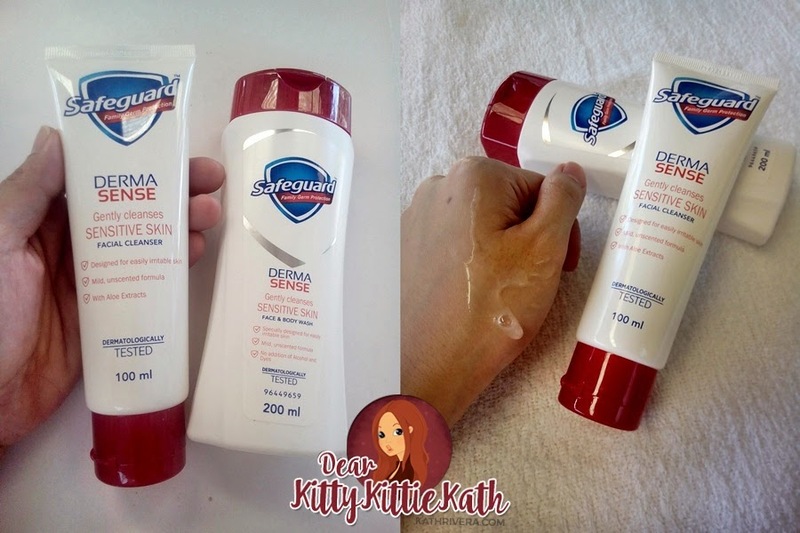 Im using Safeguard Derma Sense Facial wash for sensitive skin for almost a year now. I'm really loving it and always repurchased cuz it's really good for sensitive skin like me like really sensitive haha! Plus it's so affordable pa unlike the other expensive and high-brand cleansers. I also love love the smell it's sooo mild and smells like natural medicine made just for my face wiiiieeee u should really try this! Would just like to ask if I should also use the Safeguard facial and body wash on my face or just the facial cleanser? You can use the facial wash on the face only. If you're planning to purchase the bar, it can be used on both face and body. For this I suggest to use other soap na lang. 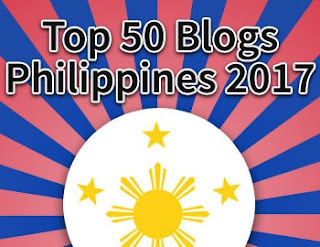 Not sure if hindi pwede pero it's better safe than sorry. Yes, I saw some sa Sm Hypermarket Fairview. 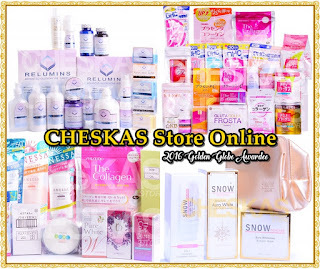 Not sure if all branches kasi have stocks pa or others kasi pull-out the products if di mabenta. The expiration date should be at the back part, bottom portion of the tube. Printed with black ink. Nope, I'm not a seller. Maybe you can try sa online stores if they carry this brand. Or have a relative here in the Philippines buy it for you na lang. How much exactly yung acne prone facial cleanser? It's written po sa taas, 199php. This price was two years ago pa. Not sure if there's a markup now. Thanks! Can I use both the cleanser and the bar soap at the same time? 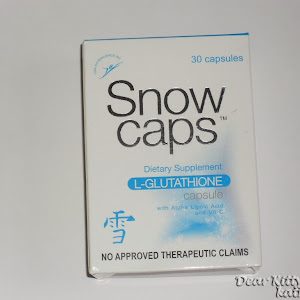 The soap is specially formulated for the face and body while the cleanser is for face lang. You can use both naman but of couse I would prefer yung gel type wash sa face para mas madaling gamitin. Thanks! I'm so sorry to hear this. I think you need a dermatologist to give you advice. It's a case to case basis especially for Acne. Hi. Noncodemogenic ba siya? Thanks.